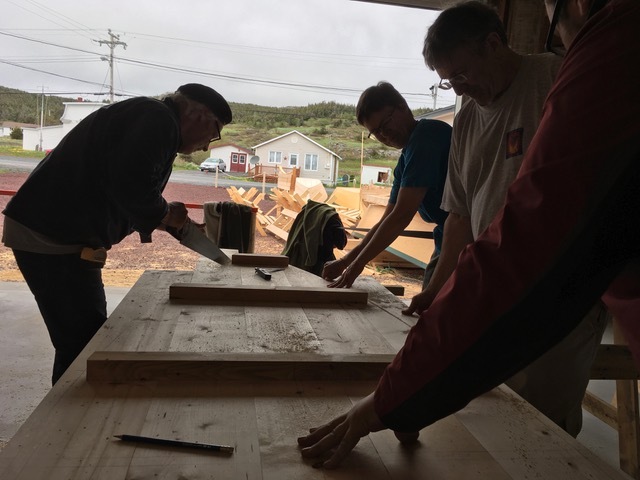 Marian, Michael, and I are spending this week at the Wooden Boat Museum of Newfoundland and Labrador in Winterton learning how to build a Grandy Dory (pictured above). I’ve been trying to get to a workshop here for a few years but this year, the pieces of my/out schedule came together. 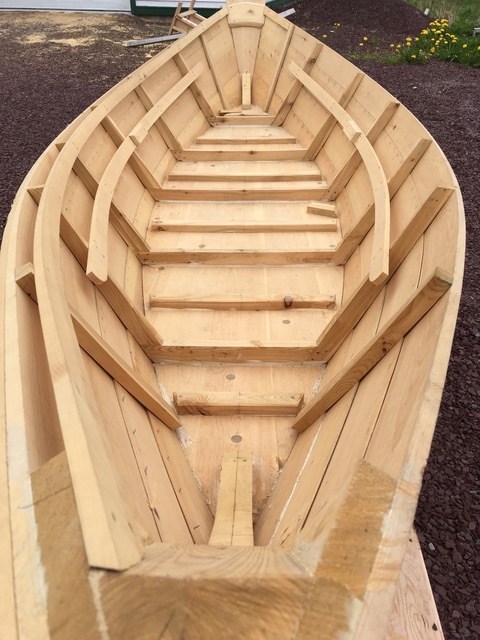 I’ve wanted to come attend a workshop with the idea of perhaps incorporating boat building (and then boat rowing) into an outdoor recreation course I would develop. It’s so great to finally be here and I’m enjoying being a student. We are learning both hand and electric tool usage in boat boating. I’ve been so thankful to my dad as well as Mr. Walton, my junior high industrial arts teacher, this week as they gave me such a strong start with tool usage. 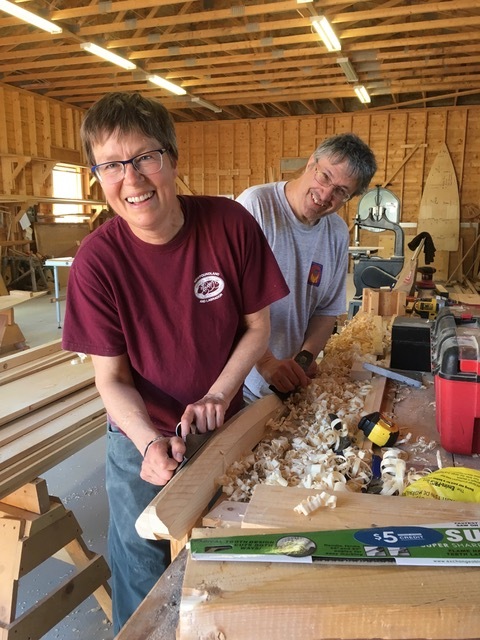 Jerome Canning is our instructor and the workshop is elevating both our woodworking skills as well as introducing us to the many steps/aspects of building a dory from layout to cutting to fastening to finishing. Today we learned to plane as we worked on both the stem and the counter (main beams at bow and stern). Our boatbuilding/nautical vocabulary is building each day as well. I’m pleased to report than my hand is recovered enough that I can do most tasks (and yes, I am listening to it and stopping if anything is tender. It’s taken longer than expected to get the incision to close but movement, stretching, and sensation are all going well). 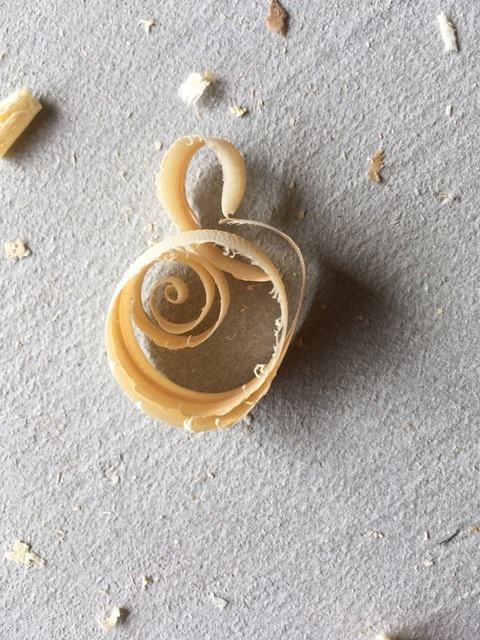 I found myself quite taken by the shaving from the plane-enjoying the curls that fell to the floor as well as being able to see the tree rings so clearly in the shavings. It’s been a good mental workout as well as we’ve had to visualize the boat in 3-D while working on bevels and angles. Last night I spent some time researching Grand Canyon and McKenzie Dories. I’m thinking it could be very rewarding to build a downriver dory and take it on a big expedition. 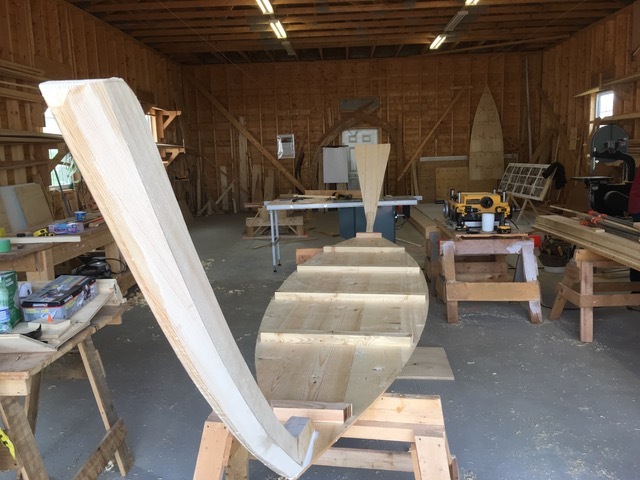 Today we finished with the stem (long piece of wood at the front of the picture) and the counter (thing that looks like a bird tail) at the stern…it’s exciting to start to have the boat take shape. Tomorrow we will attach the frames we worked on today and will use a press to give the dory some rocker…stay tuned! This entry was posted in Newfoundland and tagged 2017, boatbuilding, dory, Winterton, Wooden Boat Museum. Bookmark the permalink.